Lord’s is the home of cricket, the greatest sports ground in the world and a uniquely English celebration of style, history and self-expression. What makes Lord’s so special? Most modern sports stadiums are just that: stadiums, with all the concrete, soulless emptiness that’s implied. Lord’s is very different. It has never been a stadium and never should be. It is a ground and a club, a place of belonging and identity. Lord’s still feels like the home of cricket today. It is familiar and yet unique, grand yet welcoming. As soon as you pass through the Lord’s gates, you know you’re lucky to be there. Since the first match at this ground in 1814, cricketers from around the world have pursued the dream of succeeding at Lord’s. Something of that spirit informs the way you feel and behave in the ground today. But do not be misled: Lord’s is very far from being a genteel anachronism, cut off from the win-at-all-costs ruthlessness of elite sport. Lord’s remains the ultimate arena for the pinnacle of modern cricket. When I played cricket professionally for Middlesex, Lord’s was my home ground. It has to be the greatest office in the world. The thrill of walking on to the stage at Lord’s never dimmed: the descent from the dressing room on the first floor, down the sweeping central staircase, into the grandeur and elegance of the Long Room, out through the Pavilion steps and on to the hallowed turf of the perfectly manicured outfield. It is astonishing when you think about it. No matter how fierce the battle or intense the contest out on the pitch, every player at Lord’s begins his day with a turn through a great Victorian ballroom. I know that Americans have a tough time grappling with the fact that a cricket match can last for five days and still end in a draw. It is even harder to explain to them that the players have to walk through a chandeliered room, flanked by priceless art, to reach the pitch. That juxtaposition – visceral competition versus history, combat versus refinement – makes Lord’s the most intriguing and unusual sporting venue. And that is central to its appeal, for all types of players and spectators. Far from being exclusive, Lord’s gets into the blood of all who experience it. Justin Langer, the famously gritty and down-to-earth Australian batsman, described walking through the Long Room as being “bear-hugged by an invisible spirit”. And yet Lord’s has always been bound up with the idea of the English gentleman. In fact, organised sport and the modern concept of the gentleman evolved in tandem. Team sports were formalised and codified in the 19th century, exactly the moment when Britain was establishing its Empire. Sport was reinvented to suit the way Britain’s elite wanted to see itself. It became a means of encouraging leadership, honour and personal style. All that was surprisingly new. In the 18th century, sport had been about unadulterated pleasure, bloodletting and licentiousness. By contrast, the Victorians, with an Empire to organise and justify, recast sport as a moral training ground, sports such as cricket were about turning feckless boys into gentlemen. 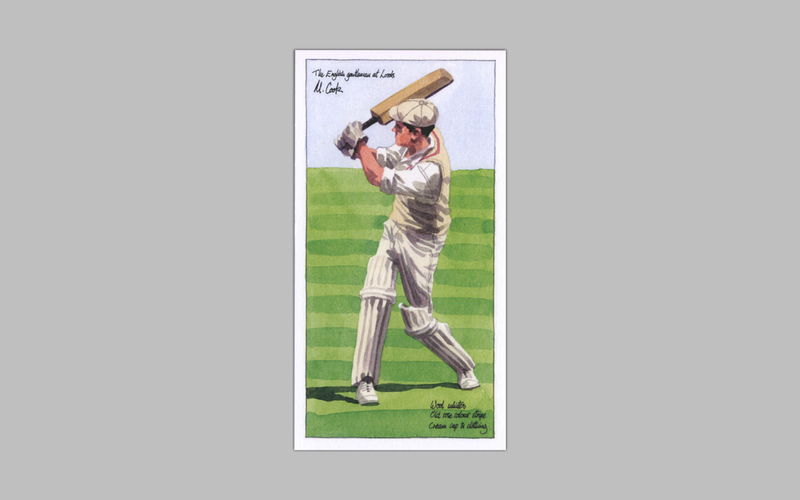 Idiom and metaphor echoed that idea: the English gentleman ‘played with a straight bat’. In reality, of course, the concept was often a total fantasy. But the connection between sport and the gentleman has never quite disappeared. Ed Smith is an author, broadcaster and journalist. He played cricket for Cambridge University, Kent, Middlesex and England.